Continuing my report on A Matter of Taste: Ceramics and Culinary Connections next we turned to the ordinary plate, a relatively recent object for an individual. Initially people helped themselves from the communal dishes and their portion was held on a trencher, actually a slice of bread which soaked up the juices and was consumed. Loaves of bread were round and cut into three layers horizontally. The poorer people were given the bottom part, more often burned than not because of the variability of the ovens, the workers the middle layer and finally the top part or the “upper crust” went to the richer or more important people. Then the trencher became wooden and needless to say since the hygiene of the day left a lot to be desired they often gave rise to the disease known as trench mouth, or acute necrotizing ulcerative gingivitis. Now I have heard that this term for the disease arose during the First World War, but this was what the docent told us. An expression that I use often is trencherman for someone who has a very hearty appetite and I once had to explain the word to an Italian including the derivation, in Italian. I wonder if he ever dropped it casually into conversation. Eventually everyone had their own tin-glazed earthenware plate, sometimes with the name and year of manufacture as you can see above. These examples above are of Haban Faience, made by the Anabaptists, a group of radical religious dissenters which arose in Europe in the the sixteenth century. Their decoration was quite simple in style and usually reflected nature. These very nice tankards were part of the display in the exhibit, with the examples being both regular drinking drinking vessels along with some very large ones which were for decorative purposes only. So what did you drink with meals in those days? Well it depended where you lived. In Britain and the Germanic countries it tended to be ale or hard cider or mead, although mead, which is made from honey, was replaced by ale as honey became more expensive. In the Latin countries wine was more usual, while perry or pear cider was very common in Britain and France. The lids were separate and added if you could afford them. They were designed to keep out the flies and other insects. In certain parts of Germany laws were passed requiring these tankards to be covered. For those who could not afford the extra expense of a lid, a slice of well toasted bread was used as a cover and so the expression to “toast” someone or something arose. Now I’d like to share a little about terminology used for this tin-glazed earthenware. The following three words were bandied about freely on this tour. 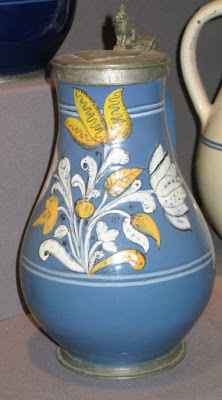 The name faience is simply the French name for Faenza, in the Romagna region near Ravenna, Italy, where a painted majolica ware on a clean, opaque pure-white ground, was produced for export as early as the fifteenth century. 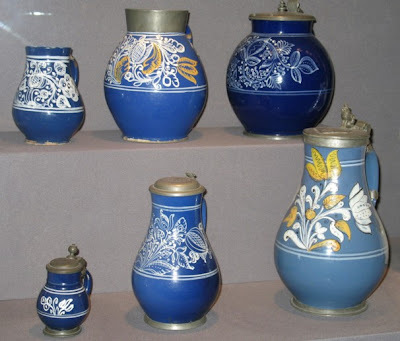 Majolica (pronounced and also spelled “maiolica”) is a garbled version of “Maiorica”, for the island of Majorca which was a transshipping point for refined tin-glazed earthenwares shipped to Italy from the kingdom of Aragon, in Spain at the close of the Middle Ages. The first northerners to imitate the tin-glazed earthenwares being imported from Italy were the Dutch. Delftware is a kind of faience, made at potteries round Delft in Holland, characteristically decorated in blue on white, in imitation of the blue and white porcelain that was imported from China in the early sixteenth century, but it quickly developed its own recognisably Dutch décor. To end on a personal note, I have visited Faenza on more than one occasion, especially to visit the Museo Internazionale delle Ceramiche or International Museum of Ceramics, a splendid museum which houses the greatest collection of ceramics in the world, with examples from classical times to pieces designed by Picasso, Chagall and Matisse. In the time honoured tradition, the craftsmen of Faenza still practise the fine art of ceramics and there are more than sixty workshops still producing today and although expensive you can buy these beautiful pieces there in many stores. 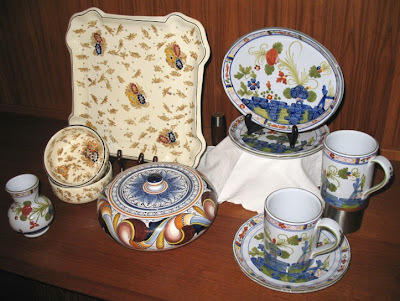 Yes, of course I did buy some on my visits and here you see a few examples of JMB’s small collection of Faenza ceramics. Yes, I do use all of them. 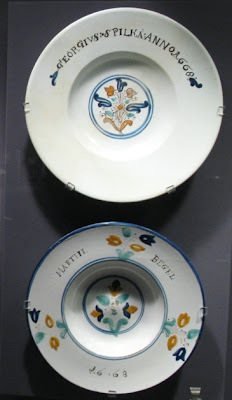 The patterns are garofono or carnation for the blue and red items on the right, fiorazzo for the beige platter and bowls and cartoccio for the blue covered dish in the centre front. There is one more post to round out this series. Just a short one really for this one somehow became quite lengthy. All very interesting but here we still use bread trenchers like the old days… no washing up!! I enjoyed the history lesson and examples of the ceramics. You have a lovely collection and I think it’s great that you use them. I inherited a collection of antique Chinese pieces and and a few English and German pieces, and it bothers me that they are mostly displayed around my house and not used. I have some concerns about the safety with the really old pieces but my parents used the rose medallion sometimes. This post may have inspired me to have a tea party and bring out the old stuff. Hi, jmb. Well, I never knew that about “upper crust ” before though I did know about trencher plates. Another great post! Very interesting about the origin of the term “trench mouth”. I love your Faenza collection and am glad to learn that you use them!